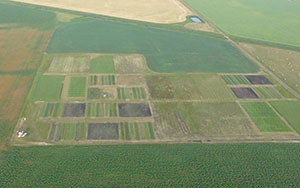 Welcome to the Glenlea Long-Term Crop Rotation Study! The Glenlea Long-Term Rotation is Canada's oldest organic-conventional comparison study. This long-term, large-scale study was established in 1992 and is completing its 25th year in 2016. This study compares an annual grain crop rotation with one that includes two years of perennial forages in rotation with annual grains. Both rotations are currently operated under three management systems - conventional, organic with no inputs, and organic with manure added. Restored tallgrass prairie plots serve as a benchmark for ecological indicators. Read more about the Glenlea Study at the links at the bottom of this page. This page created October 2016.